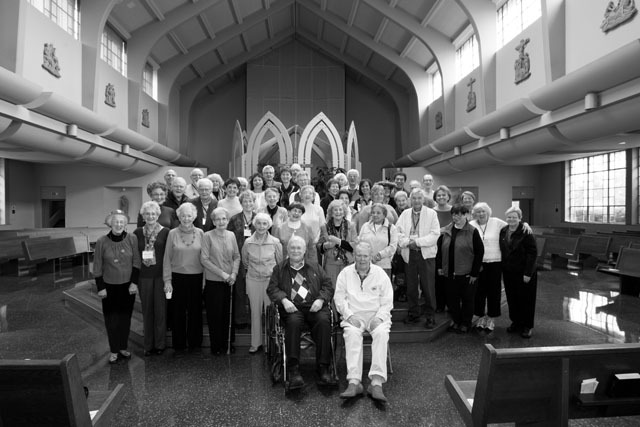 Carpe Diem (Latin for “seize the day”) is a community of parishioners aged 55+ years old at Sacred Heart Church providing opportunities for social connection and outreach, spiritual and personal growth, and service within the parish and wider community. Members, friends, and any parishioners 55+ are welcome to enjoy quarterly catered luncheons, monthly potluck dinners/lunches (with feature films! ), and hospitality hour following the monthly healing Masses. There are also weekly bridge groups as well as occasional daytrips. These outings have included: a Seattle Symphony series, a Microsoft art tour, a trip to view the Bellevue Botanical Gardens’ Christmas lights, guided tours of the Bellevue Art Museum and new Bellevue City Hall, a Christmas concert at Kirkland Performance Center, tour of St. James Cathedral, Benaroya Hall tour, Seattle Aquarium tour. Won’t you please join us? We always welcome new members and friends — the more, the merrier! See “Membership” section below for details. Here we are, Lord, your older children. We come today to honor you in our own special way. We have been busy with many things. In our lives we have sometimes been more like Martha than Mary. But we have more time now, and we ask your help to spend it well. Give us the strength to be an inspiration to our families. Grant us the courage to be positive, when we are faced with the challenges of life’s journey. and appreciate your beautiful world. Let us bring joy and laughter to those around us. Assist us in enjoying and cherishing each other, in being tolerant of our frailties and short-comings. Let us appreciate each other’s gifts, talents, and shared life experiences. By being closer to each other, we are closer to You. We have many things for which to be grateful. You have given us so much. We thank you for all your gifts and even for the challenges in our lives. We thank you for each other. We thank you for Carpe Diem and our community at Sacred Heart. Daytrips & Concerts & Plays — Oh My! Carpe Diem sponsors regular weekly bridge groups meeting downstairs in the parish social hall. (For schedules or other information, please contact Frank Powers, (425) 454-2550.) You may drop in anytime you wish. Just bring your lunch — beverages will be provided. While guests and visitors are welcome to attend any of our events, please consider becoming an official member of Carpe Diem to help support our programming. Membership is open to parishioners aged 55 and over, and since we are self-supporting, we suggest an annual donation of $20 per member to help defray expenses. Depending on your budget, you may contribute more — or less — if you like, but no one will be turned away for lack of funds.To obtain a membership form, please contact Mary Dickins, Pastoral Assistant for Carpe Diem, (425) 450-3908.